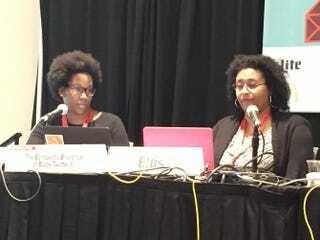 Meredith Clark and Kimberly Ellis speak at a panel on black Twitter at South by Southwest March 13, 2015, in Austin, Texas. “Through the posting of two photos and a hashtag, thousands of people where able to change the media narrative around the coverage of Mike Brown and around the coverage of individuals who might find themselves in a similar situation,” said Meredith Clark, a journalism professor at the University of North Texas, during a panel discussion titled “The Bombastic Brilliance of Black Twitter II” at South by Southwest in Austin, Texas. She was joined on the panel by Kimberly Ellis, a scholar and social media strategist who has written a book about the power of black Twitter. The panel was a follow-up session to Ellis’ 2012 SXSW panel of the same name (which is also the name of her upcoming book), which was born out of frustration at mainstream media’s early dismissiveness of black Twitter. Both women cited a 2010 article from Slate, “How Black People Use Twitter,” which presented a series of funny, sometimes ratchet, hashtags that failed to capture what was really happening on black Twitter. “I’ve been on Twitter since 2009, and my experience doesn’t reflect this truncated analysis,” said Ellis. She set out to show that black Twitter—like the black community itself—was more than a series of ratchet hashtags. And over time, Ellis has been proved right, with black Twitter becoming the driving force behind some of the most important stories over the last several years. Many of these stories would have otherwise gone unreported or underreported—think Trayvon Martin or Michael Brown—if not for the power of black Twitter. As to how black Twitter can better harness its power, Ellis believes that forming stronger bonds with other like-minded communities—LGBT, immigrant activists, feminists and others—will only make their voices louder.